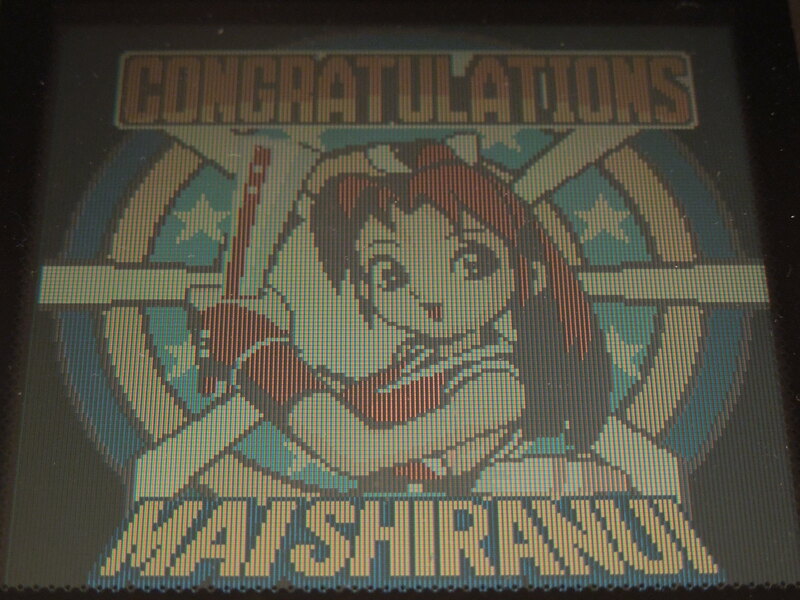 Note: This game was played on a Neo Geo Pocket Color in a well-lit room. 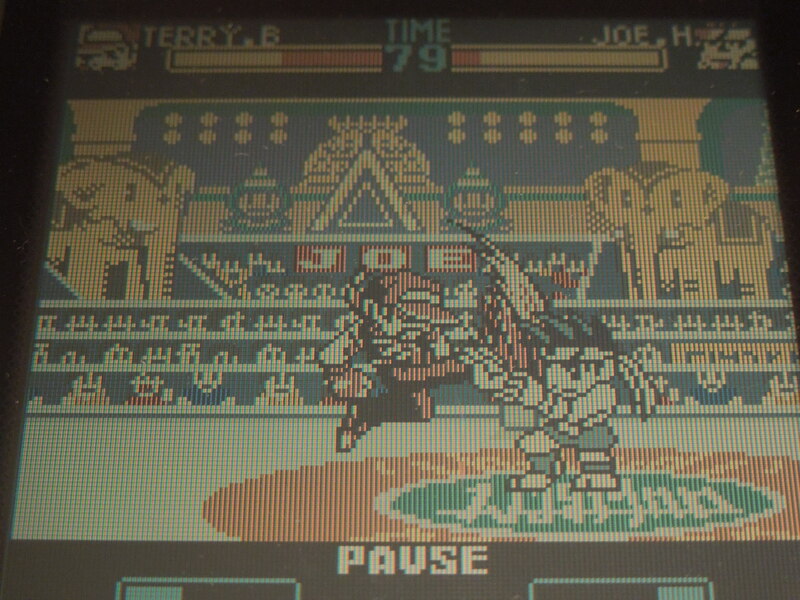 The Neo Geo Pocket Color doesn’t have a front light or backlight (unless you purchase a modded system or a Nyko light), but the game looks fantastic as long as you play in a room with adequate light). Quick History: Released in 1999 for the Neo Geo Pocket Color handheld system, Fatal Fury: First Contact was the only game in the Fatal Fury series made for anything other than a home console. Considered by many to be a port of Real Bout: Fatal Fury 2 for the Neo Geo AES home console, First Contact has less playable characters than its console ‘counterpart.’ The game doesn’t appear, in my opinion, to be a proper ‘port’ of that game however, as its art style distinctly sets it apart. Special Moves are a cinch to execute. 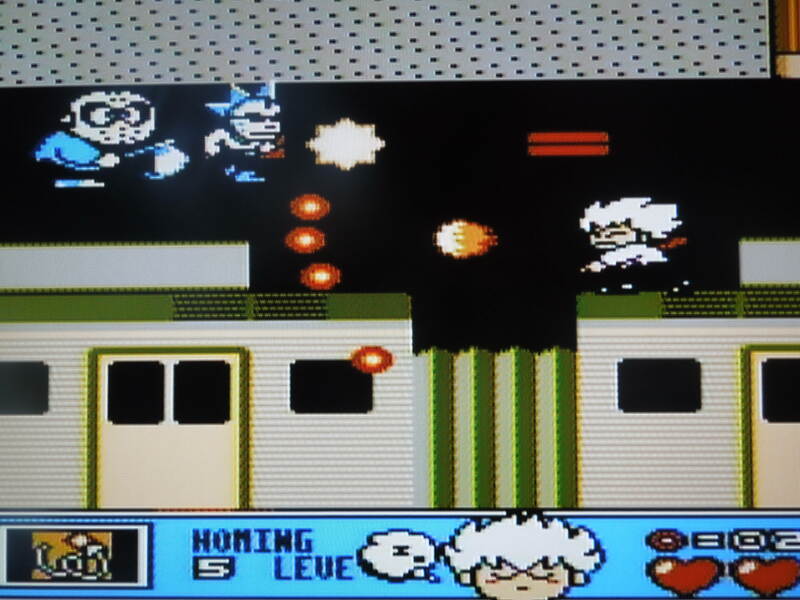 Saving: Directly from the game manual – “1P PLAY MODE data is automatically saved when each stage is cleared.” Essentially, you have to beat 8 of the game’s 11 characters in order to beat the game. After you’ve played through the game once and ‘beaten’ it with your chosen character, then every ‘stage’ becomes selectable to you in the Configuration (Options) menu. So, basically, you can choose how many opponents you’ll face before you beat the game (example: select to start on Stage 8, and you’ll only have to beat 1 fighter in order to beat the game. Note: opponents are always random no matter what ‘stage’ you start on). Controls: First Contact, like most Neo Geo Pocket Color games, uses all 3 of the available buttons. The joystick moves your character in all directions. Forward, Forward dashes at your opponent. Back, Back evades (jumps backwards). A punches (tap for light, hold for strong). B kicks (tap for light, hold for strong). 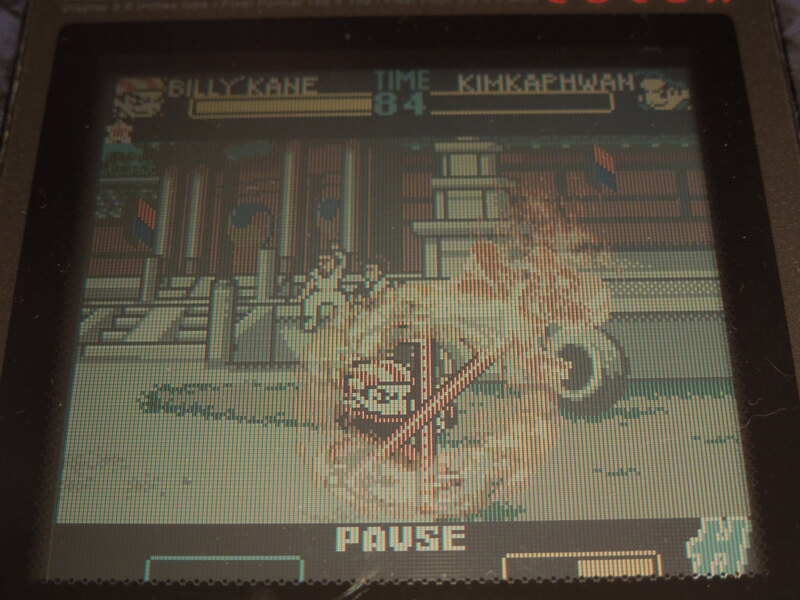 Different combinations of joystick motions plus buttons A or B execute special moves (example: Billy Kane’s ‘Fire Dragon Pursuit’ requires you to press Down, Back, B). The Options button + left or right taunts. The Options button without pressing left or right pauses the game. Music and Sound: Great. Now, bear in mind we’re talking about a handheld console from 1999 and small game cartridges, but the music is quite enjoyable. Different stages have different musical themes, and the majority of them are quite memorable and atmospheric. The sound effects are great as well, particularly the special moves. Punches, kicks, fireball attacks, and combo attacks all sound satisfying. 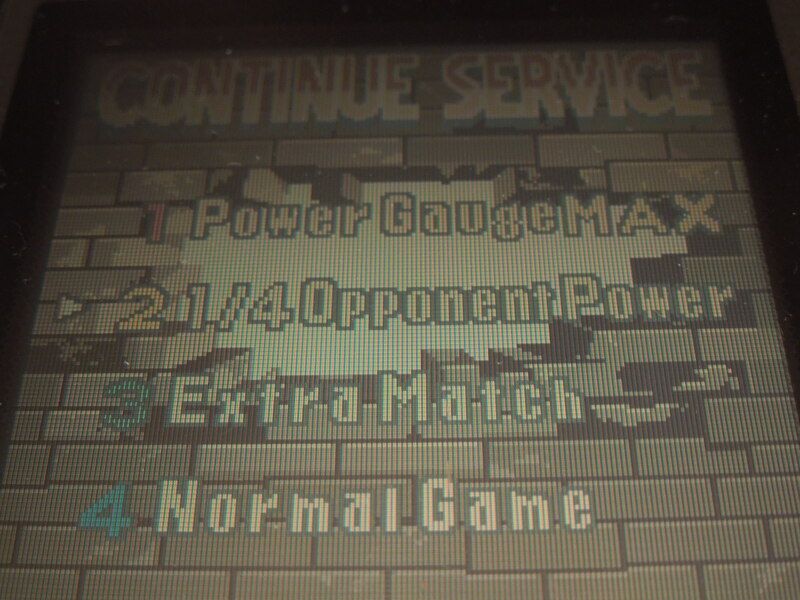 H, S, and P moves require you to fill your power gauge. Extra Moves: You have a ‘power gauge’ at the bottom of the screen that fills as you use special moves or guard (block) in battle. It fills to certain levels marked by an individual letter: H (Break Shot), S (Mighty Mauler Moves), and P (Hidden Ability Boppers). When your power gauge reaches each letter, these specific moves become available to you if you input the proper commands. For example, when playing as Geese Howard, when your power gauge reaches letter P, you can execute the ‘Raising Storm’ move by pressing Toward, Back, Down, Toward, B. All of these ‘extra moves’ are extremely powerful, even more so than your character’s regular special moves. 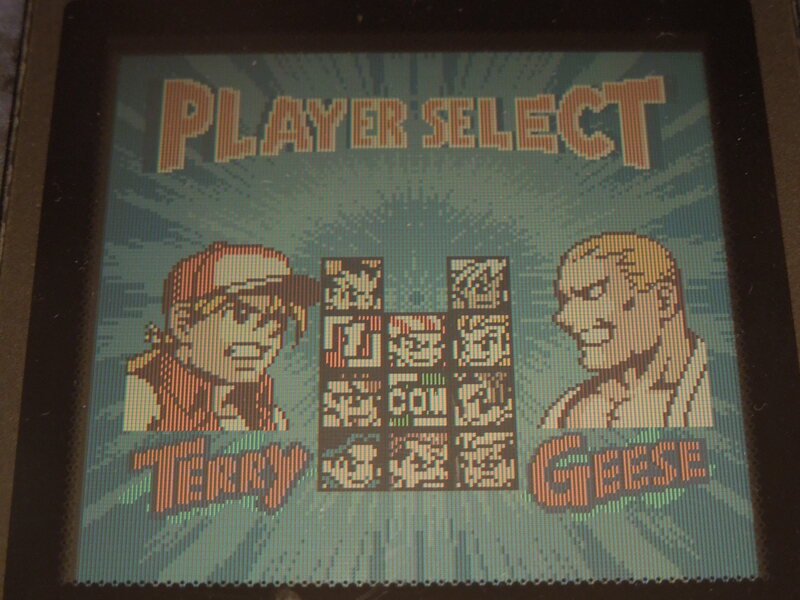 Characters: 11 characters are selectable (with 2 ‘secret’ characters, 1 of which is only available in 2 Player VS). Rick Strowd, Li Xiang Fei, Terry Bogard, Andy Bogard, Joe Higashi, Mai Shiranui, Geese Howard, Billy Kane, Kim Kap Hwan, Ryuji Yamzuki, and Wolfang Krasuer. Each one has his or her own unique special moves, and, from my experience, the balance among them seems extraordinarily fair. Each character has their own unique look as well (no ‘palette’ swapped characters, here). 11 characters are selectable, including 2 ‘secret’ characters. Configuration (Options) Menu: In the Configuration menu, you can set the difficulty (Easy, Normal, Hard), the time (45 sec, 60 sec, 90 sec, or no time limit), the COM or VS win point (best of 3 or best of 5 matches), the stage (select where to start your quest to be the best – only available after you’ve beaten the game once), BGM and SE (sample the music and sound effects in the game), and Memory reset (delete any ‘stage’ data you’ve saved). Continues: If you lose a match in First Contact, you can continue by pressing A (no limit on continues). Before you re-play the opponent you just lost to, however, you have unique options: Power Gauge Max (start the match with your power gauge already at S power), 1/4 enemy energy (your opponent starts the rounds with only 25% of his or her health bar), 1 match give-away (you only need to beat your opponent once – no ‘best of 3’ or ‘best of 5’ matches), and No Service (just a regular rematch option). Lost to your opponent? No problem, just set the odds in your favor for the rematch. So, where can I find this game? EBay and Amazon. 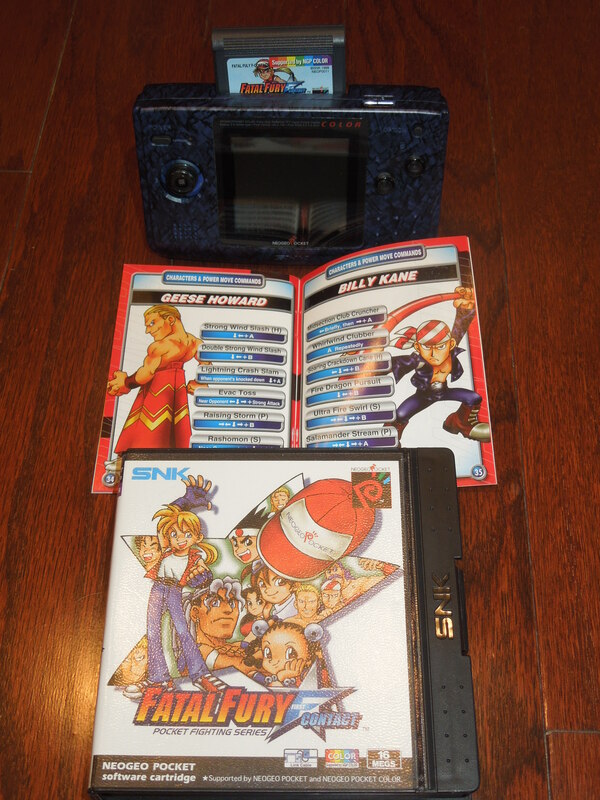 Sadly, the Neo Geo Pocket Color was not a (commercially) successful handheld system, and because of it lack of commercial success, its easy to find the handheld and many of its games on online retail sites. You can also play the rom on a computer emulator. Conclusion: Fatal Fury: First Contact is one fantastic game. Honestly, its unfortunate this title was only released as a handheld exclusive because it would look great on the SNES or Sega Genesis, had it ever been released for those systems. The characters have a somewhat ‘super deformed’ look that is cartoony, and that only helps the game’s presentation – it sets it apart from the many Fatal Fury games that were released for the Neo Geo AES home console. One thing I really like about First Contact is how easy it is to beat the game with each character (because of the ability to start on any ‘stage’ after you’ve beaten the game on your first run-through). Also, I like the ability to set the table to your advantage if you lose to the CPU. Is the CPU tough? Sure, if you set the Configuration to Hard. Are the special moves and ‘extra’ moves easy to pull off? Yes, they are extremely easy to pull off, especially with the Neo Geo Pocket Color’s joystick – I have played the game with all characters, and once you learn each character’s special moves inputs, you’ll be well on your way to mastering the game. Note: Either buy a copy of the game that includes the manual (which includes special and extra moves control inputs), or look up the characters’ moves online. Trying to beat the game with each fighter adds replay value. This entry was posted in Neo Geo Pocket Color - Fatal Fury: First Contact and tagged Fatal Fury: First Contact Review (Neo Geo Pocket Color). Bookmark the permalink.